If your chair is too high, it can cause compression behind the knees. This can cause numbness and poor circulation to the lower legs or cause swollen sfeet. Make sure you’re the correct distance from your computer monitor. No closer than 14 inches and no further than 30 inches, is ideal. Using a Swiss Ball adds to your success because it keeps the spine more mobile and active, and helps to strengthen the core... but remember, without proper alignment, it won’t be much help! The term "ergonomics" is derived from two Greek words: "ergon," meaning work, and "nomoi," meaning natural laws. It is the study of human capabilities in relationship to work demands. Humans are not designed to sit for long hours at a time in one place. We were made to move! Unfortunately, many of us have jobs that require us to sit in one place; more often than not, in front of a computer screen. 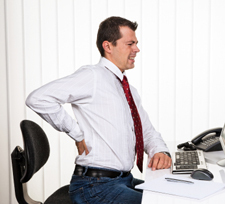 So, unless you are lucky enough to be sitting in an ergonomically designed work station with your body properly aligned, you are probably causing yourself pain and discomfort and are risking injury. By placing our body in the wrong position on a daily basis, you are overworking your muscles and causing major muscle imbalances. 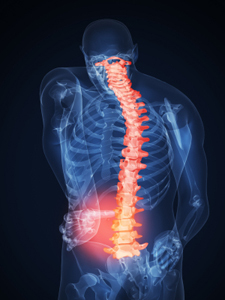 Your muscle become shorter and tighter, and, in turn, alters the curvature of the spine. Some people have heard that certain special equipment like Swiss balls or ergonomic chairs can help improve posture at the desk. In fact, it doesn’t really matter what you’re sitting on, what matters is understanding how your body should be positioned to cushion the upper and lower back and neck. Pain and discomfort won’t go away without knowing where your body should be aligned and it’s critical to stretch and strengthen the muscles to hold the proper position. Make sure that your chair is the correct height, so that your feet can be placed flat on the floor with your legs at a 90 degree angle at the knee. In order to correct your posture at work over the long term, you should be doing stretching and strengthening work along with having proper ergonomics in place. Gary Jasmin is a certified C.H.E.K. coach, practitioner and trainer. As part of his holistic approach to health and wellness, he can help you to understand more about how you can improve your core at work. Click here for more information on posture and corrective conditioning.